This is a view of about 1/3 of the show floor! I took a look at Penn's new Slammer III, new Torque spinning reels. The new Torque reels look much more refined, nicer machining than the first production designs. The Slammer is basically a less expensive version of the Torque. More info on these later in the week. Other stroll-bys today, Okuma! New spinning reels in the Metaloid line, also an impressive Makaira spinning. For me the big one was a new size for Andros and Metaloid series reels. Saw a couple interesting accessory products, an update -long awaited- of another product we'll have in stock next week... 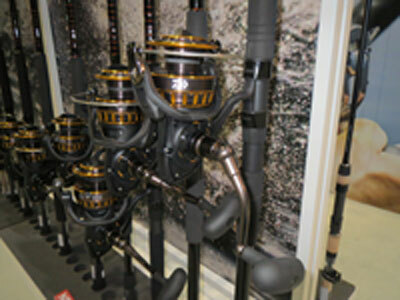 But the most interesting for me was visiting Daiwa's booth. I'd heard there was a new BG reel, read a bit about it, and was sad to think the venerable OLD BG was gone. (I bought my first one while living TX in 1980/81, added four more sizes over the next five years...). Well, today I learned that the old BG was indeed still in the line, with the addition of a new BG. It's a big one for Daiwa. Great features, price, the new BG will be well received by a lot of folks. I was equally impressed, from a saltwater hard use perspective, really more impressed with the new Saltist spinning reels. These are nice, and there's reason for their added expense. Both series will be well received, both will appeal to different uses and needs. I'm thinking the Saltist is the choice for offshore, the BG for mixed use fresh/salt inshore. There was one introduction that you really needed to feel to appreciate. The new Saltiga star drag reels are so refined, so smooth on drag at light or heavy settings, they really are things to admire. Like the old Saltiga star drags of almost 10 years past, the machining is exceptional. The reels are not tin boxes, they have substance. So, they didn't go for a light weight record, they built a strong, beautiful and refined powerhouse of a reel. It's a star, not a two speed lever drag reel, and indeed two speeds have their place, but equally so do star drags. Both have a place in a guys arsenal. Freespool and casting prowess? Well I haven't tried one, but I sure did spend more time than I'd planned spinning one (and waiting for her to stop). Wasn't heavy weight and inertia creating the spin, it's how they put the reel together and the parts they used. If you get the chance, play with one yourself. The old Saltiga star drag was a reel a lot of us never wanted to see discontinued. It was the state of the art of it's type, by far. The new Saltiaga does justice to it's lineage, and then takes things to a higher level. Impressive pieces. Another interesting day. Couple meetings, helped at the Toro booth, even got to do some rigging - special thanks to Megan from our SD shop who has been covering questions at the Toro booth, and half the day she's been abandoned by me while I stroll about looking for gems. Visited with the folks from 100% TRUTH. Wonderful folks, down home, unpretentions, honest, innovative, having some fun creating a good product. I like these guys, visit their website and check 'em out. Meet the players yourself. I'd be happy to be neighbors with any of 'em. The Truth guys are good folks, trying to do the right thing, the right way. We've supported their reels now for maybe four years or so. Been fun watching the firm grow. But, note they have simply gotten better, doing what they originally designed. Might say they've just kept on refining their product. Good stuff. They have a new reel, really a rather specialized larger size, mono intended, kingfish and marlin reel. Definitely a piece with great appeal to a select group of anglers. This is a private yacht/boat kind of reel. Ain't gonna be seen on a long range trip, but will be on a lot of boats fishing the Atlantic and Gulf. Always nice to see some internal comparisons. 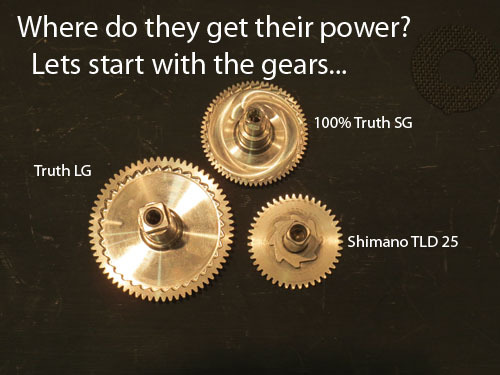 SG, LG and TLD (25) comparison. 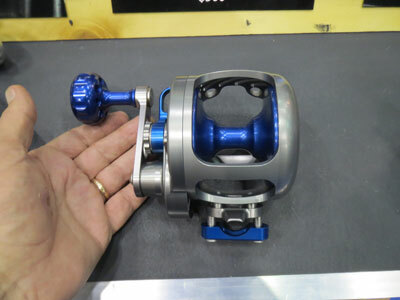 As mentioned, the Slammer 3 took best Saltwater Reel at the show, full line of 'em and basically an easier to produce Torque. I'll digest the tech stuff back home. 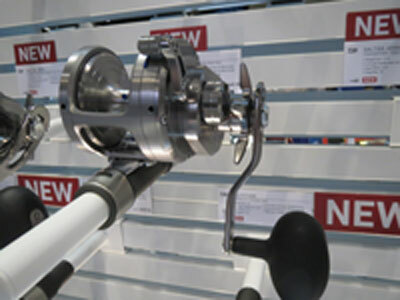 But, bottom line both the new more refined Torque and the Slammer will be strong contenders in the higher end spinning reel market. Back over to Okuma to finish up our order and play with new gear. Really a lot of new gear, already mentioned. First off, the new Makaira spinners, two models, will be excellent. Again, some new wrinkles on their design and a recognition of certain things such as lefty/righty conversion that recognizes some problems associated withh making that switchover as easy as a handle swap. On the hand end, that's not a great feature to have, on the most demanding applications. Sorry the pic isn't better. The reels are gorgeous. Metaloid and Andros 12 narrow two speeds. The Metaloid will have a lower top end gear ratio than the Andros, and that makes sense to me. The hard thing about the Andros 12SII was it's high gear, more costly and more difficult to product. Price will go up on that model as a result. The 12N size is really something we will be excited to see. Great casting and jigging size. The new Komodo 400 size - this one will be available in two gear ratios. Makes good sense to me...we ordered 'em both. Some very positive improvements over what was an excellent reel. I really like the new cosmetics we'll see on the Komodo 300/400 reels. 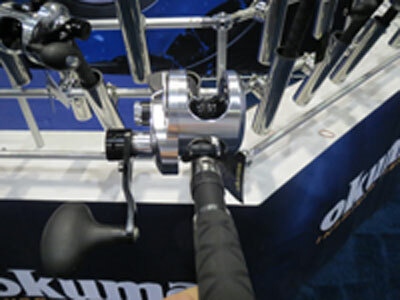 There were a number of other new products shown by Daiwa, Penn, Okuma which we did not post. Same for other show winners. Still mulling over some of 'em. All in all, a very interesting show with strong new pieces coming to fishermen. Competition sure is a wonderful thing. And, when you take competition out of the equation things go south...we've seen that evolution from another nameless company I've not stocked since 2005... They've got nada, no love from Best of Show status since the show's organizers stopped allowing rep groups from voting for the best new products and really little to no innovation. (That firm used to really stack the deck since they had so many staff working the show. Now status has to be earned...) Of course that's my biased opinion, but it's looking like that feeling is being shared by many more at this years show. Seemed to me that Daiwa, 100% Truth, Penn and Okuma sure had a strong showing this year. 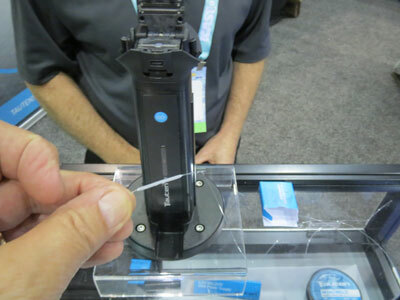 Biggest ICAST that I've attended, and next year promises to be even larger since the show sold out so soon this year. there were many manufacturers that couldn't get a spot this year.